This is a story with a flipside. Probably a couple of flipsides, actually. And it has me rather conflicted. It’s a simple story about a new way to design circuits, leveraging ideas from other industries. Uber was called out by name as an inspiration, although, as we increasingly see, Uber isn’t necessarily an ethical model to follow. But there are others in that same space, and it’s the common ideas that apply. And we’re going to apply them to design. Today, if you need a circuit of some sort, you have a couple typical options. The older, more traditional one is that you hire engineers and have them do the design for you. A more recent option goes to off-the-shelf IP to fill this need. It’s been a make-vs.-buy world ever since. But those two predate the so-called “gig economy,” where, as a worker, you’re not affiliated with any particular company exclusively. You work when you want on what you want. Today you work for this company; tomorrow for another. You might work for both at any given time – drivers may have both Uber and Lyft gigs at the same time. The benefit of this? Well, in general, it brings flexibility and freedom. You can engage in a particular business without the effort of breaking in to closed communities like taxi drivers, which use medallions as a way to limit who gets to drive and how much competition there is. To look at this in more detail, however, and to assess the downsides, we need to pause and sketch out how circuit design gigs work. A buyer contacts eFabless with a project they want done. Let’s say they need some particular filter. They work with eFabless to set out a list of key parameters and their design targets. A firm offering price is set to keep this from being a complete race to the bottom based only on price. A deadline is set for design completion. The earliest completion isn’t necessarily the winner, but only designs that are complete by the deadline are eligible to be winners. eFabless summons the competitor masses; individual interested competitors sign on. The competitors each start designing. In the likely event that individual designers don’t personally own expensive design tool suites, eFabless provides one that they assembled from open-source tools. On or before the deadline, designers submit their results. The designer with the best specs wins. If there is something close to a tie, then the next prototyping stage may determine the winner. All the losing designers can place their designs for sale as IP through eFabless. Will people sign up for this? Evidence suggests, “Yes.” Their first challenge was a low-power bandgap regulator; power was the parameter by which they’d be judged. And they got 75 sign-ups. 75 competitors vying to be paid for this design. Given how expensive commercial EDA tools can be at aggressive nodes, you might wonder how this works – how eFabless could compete with the Big 3 using what are essentially free tools. And this is where they’ve limited their market intentionally: they don’t go for the ultimate FinFET-fest at 10 nm. At present, they’re focusing on 90-350 nm, with particular interest in analog, which, they say, requires a smaller test suite to validate. High-voltage circuits are another promising area. So this isn’t mainstream, at least, not at this point. They also see this as a way for smaller companies to participate in the market. We’re used to masks costing millions of dollars, but not at these older process nodes. If you have the luxury of time so that you can fill part of a shuttle wafer (200 mm), then costs to produce can be on the order of some hundreds of dollars per square millimeter of die area. So, having looked at how this works, what are the pros and cons? This can really be answered only by looking at the individual stakeholders. Let’s start with the buyers. For small companies, this gives them access to temporary design resources that they might not be funded to hire outright. And they don’t have to keep them on after the project is complete. They get to set the price they’ll pay – assuming it’s high enough to get designers interested. And they have no employer obligations to the designers – no benefits, in particular. How about eFabless? They get a cut of the winnings, so they have an incentive for this not to be a race to the bottom on price. Much of this will, of course, work to pay off initial investments in the infrastructure and tools. It’s harder to say what their ongoing costs would be. While much of this might look like a low-cost software model, they will need consultants to help define projects. And, in the event that a winning designer doesn’t stay the course, eFabless picks up responsibility. And then there are the competitors, and this is where my stomach churns a bit. Certainly, for designers looking to work part time on their own terms, this is great. Perhaps you’re between jobs; you can patch the income gap this way. They also mention that some of the competitors are retired and doing this just for fun or to keep their tools sharp. They might even be willing to do it for free, since income isn’t their primary motivator. That’s why I think it’s important that there be a fixed price so that people who don’t need the money can’t impoverish those who do. One of the less obvious benefits is the very fact that someone of retirement age could participate. Silicon Valley is rife with rumors (but no lawsuit-quality proof) of rampant ageism. If you have “too much experience” on your résumé, it’s not likely to get many (or any) responses. Sand Hill at one point declared (and later walked back) that older folks simply can’t have new ideas. Well, this is a way for them to get back into the game and challenge that malarkey. What about the downside? Well, my first question was whether this threatens traditional jobs. To a certain extent, it doesn’t – at present. That’s because they’ve focused on a narrow segment. But if this became a more common thing? 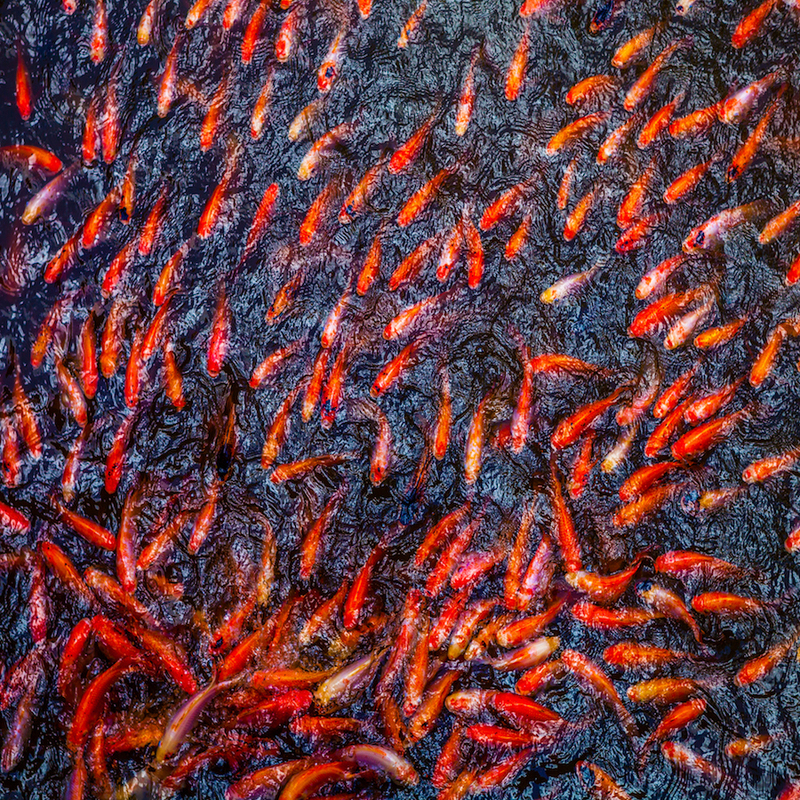 Part of me sees this as tossing food into a koi pond or a trout feeding trough: a chaotic frenzy of fish pushing each other out of the way, each trying to be one of the few that actually gets a morsel. I mean, here’s the deal: if you participated in that first project, then you were one of 75 such participants, only one of which would actually get paid. That’s a hell of a crapshoot. In fact, those odds are twice as bad as the worst roulette odds (single number, 35:1). From a pure efficiency standpoint, it’s horrible: 75 times the amount of work being done to get a single design complete. If you’re not the winner, you could still make some money by marketing your design as IP. That’s better than nothing, but it’s still a longshot: that first project had one winner and then an immediate 74 IP competitors. I have to admit that some of this comes from a rather old-fashioned sense of what work used to be. There was a social contract such that, if you worked hard, you could count on some stability and raise a family and have a life (at least for some segments of the population). That has eroded significantly – more in some areas than others. I don’t want to wax too melodramatic, but there’s something about quality of life that’s becoming less available to your average Joe. And this design crowdsourcing effort, intentionally or not, can feel consistent with that narrative. What do you think? Is this an efficiency play, giving broader access to start-ups and engineers that are poorly served by the standard market? Or does a move like this start a gradual erosion of the value of engineering and a shift in economic power? Let us know your thoughts in the comments below. * Participating in the project includes averring that there are no conflicts of interest or violations of employment agreements by designers looking to moonlight for a few extra bucks. Design liability falls to the winning competitor; liability insurance is not required to participate. What do you think of eFabless’s gig rendition of engineering? Nice article Bryon! I guess similar forces have already taken hold in journalism and engineering may be next. The underlying model is “winner takes it all”. However at some point there may be no koi in the pond or only so few that prices may rise again. Another aspect is the cost of living. A smart kid somewhere in the world with a very low cost of living may be able to make a fortune with the bounty but for a Silicon Valley engineer it will not be enough to pay for a camp site. Interesting times! Good article — you are not being too melodramatic at all. This kind of competition-based crowdsourcing is creating a system of digital sweatshops. As you pointed out, most participants in these projects put in many hours of professional-level work without any compensation. This may be okay for engineering students, but any non-student who wants to be an engineer for a career should absolutely avoid participating in these types of competitions. Even for retired engineers, the ethics of participation in winner-take-all projects are dubious. It’s one thing to do charity work for an non-profit organization as a retiree, but it’s another thing to give for-profit companies a distorted sense of what design work really costs. Doing below-cost work takes away from practicing engineers who are still trying to make a living. As in any profession, there is always competition for the best jobs — but engineers also need to stick up for each other. We must not sell each other out for the benefit of the owners of these crowdsourcing websites. I am not against “gigs” as traditional, contract-based work, and of course, bidding for contracts is often competitive. The problem is when the whole project is a winner-take-all contest. Karl – Yes, this has happened to journalism. I occasionally hear rumors of youngsters offering to replace me for free. Fortunately, the specialized knowledge required to resonate in this area limits how many potential replacements there are. I also do freelance ghostwriting work, and, fortunately so far, those sorts of gigs mostly operate on a traditional, professional level. I did get one opportunity where it was clear they were soliciting “examples” from a bunch of folks, and one would get the gig – after the work was done. I declined to participate. The ironic thing was that the technology area related to scheduling software that tends to be the bane of retain workers, making it impossible for them to earn a living with multiple jobs. In our particular area of journalism, talent and expertise like Bryon’s are rare and hard to come by at any price. We are lucky and thrilled to have him with EE Journal! Bryon – First of all, let me applaud you for a very thoughtful and very timely article! We closed the first design challenge on your publication date and announce the winners March 28. There are a few items for fact correction (e.g. 88 designers in the challenge), but you raise an important and fair question – how to make sure that engineers can make a robust living in return for their contributions. We are community centric and our mission is to empower engineers to create and be rewarded. We specifically target on-demand IP (and later IC), which is an unserved market and not price sensitive. We also give the designers a market place where they can market their own creations at prices that they set. We are extremely conscious of not catalyzing a race-to-the-bottom. As such, we don’t aim to reduce the lifecycle costs, per se; we transfer upfront design costs to downstream revenue sharing and provide broad access to technology in a way that promotes risk taking and allows all to benefit. Software and software engineers benefited from open innovation. We view ourselves as key to making something similar happen in hardware and semis with similar benefits for all. I encourage readers to visit our marketplace and see how we feature and empower the community designer. Since you first talked with efabless, our community has expanded to over 1,000 community members from more than 30 countries. Starting today you will see three designers and their challenge designs in the marketplace. Designer profiles are populated with information that they want to share and with objective efabless information recognizing accomplishments (today “badges”). Information is searchable and viewable by all visitors. The detail and access to their IP blocks is available to registered users and is fully protected. Thank you for your interest in efabless. Thanks Mike (and Nanette). Just quick, on the number of entrants thing, it sounds like the number grew after we talked. So I used the number as of our conversation (which is what I had at the time). Sounds like you got even more interest after that.